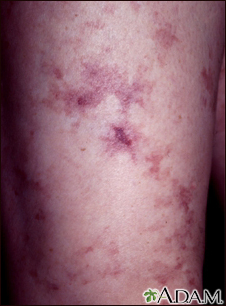 This is a close-up view of livedo reticularis. Livedo is a descriptive term used to describe the red, non-blanchable (doesn't turn white when pressed) network-pattern (reticulated) in the skin caused by plugging of the blood vessels. This condition has many causes.